Additional Info: Namibia attracts ecological tourists who come to experience the different climates and natural geographical landscapes such as the great eastern desert and plains. Namibia travel and tourism is distinguished by vast open space and year-round blue sky for those seeking an alternative African experience. Etosha National Park in Namibia was first established in 1907, when Namibia was a German colony known as South West Africa. The Etosha Pan dominates the park. The salt pan desert is roughly 80 miles long and as wide as 30 miles in places. The salt pan is usually dry, but fills with water briefly in the summer months, when it attracts pelicans and flamingos in particular. Stay in a bush camp and join a wildlife viewing tour where among others, one might see lion, leopard, elephant and black rhino. Sossusvlei is a salt pan in the central Namib Desert, lying within the Namib-Naukluft National Park. 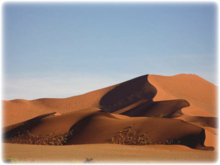 Fed by the Tsauchab River, it is known for the high, red sand dunes which surround it, forming a major sand sea. Entry path to Dead Vlei starts 1,500ft before entering Sossusvlei with a 4x4 (best way). It is 0.6 miles (one way) heavy trip over sand dunes to the exciting salt pan with both dead and green trees. The oldest trees are 900 years old. Climb a sand dune to watch as the early morning light reveals a sea of orange dunes. The Skeleton Coast is the northern part of the Atlantic Ocean coast of Namibia from the Kunene River south to the Swakop River, although it is sometimes used to describe the entire Namib Desert coast. 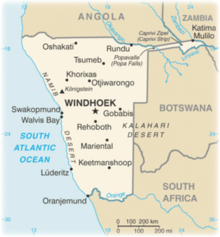 The Bushmen of the Namibian interior called the region "The Land God Made in Anger", while Portuguese sailors once referred to it as "The Gates of Hell." The coast has been the subject of a number of wildlife documentaries, particularly about adaptations to extreme aridity. Many of the plant and insect species of the sand dune systems depend for their moisture on the thick sea fogs which engulf the coast and windblown detritus from the interior as food. Scenic flights over the dramatic desert can be enjoyed of this haunting but beautiful location.